Monkey in the Middle is a fun passing game that is a good warm-up to a passing training session. This game works best with younger players from under 8 to under 12. Have the team form an evenly spaced circle about 10 yards in diameter. Depending on the number of players and their skill set, have 1 to 2 players step into the middle as defenders. 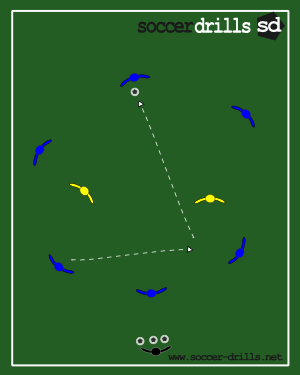 The players along the parameter of the circle attempt to pass the ball around the circle avoiding the defenders. If the defender wins the ball, the person making the mistake that turned over possession now becomes the defender in the middle of the circle.